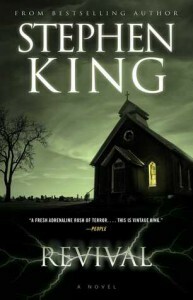 I am a newbie when it comes to Stephen King books. Only having read a few (and only recently), I am still finding my way through his works and my opinions have been varied. With Revival, I had this feeling of recognition as if I had read a similar story before, but couldn’t place it. The pacing was very lax and the ending… weird. I have yet to fully form complete thoughts about the book as a whole. We follow the story of Jamie and his life-long association with Charles Jacobs. Although Charles only comes into his life sporadically throughout the novel, it really does focus on him and his achievements with electricity. Jamie’s life is one full of miracles. He watches as Charles (Pastor Jacobs at the time) performs a miracle on his brother. Moving on to his love for music, joining a band, his first love, drugs and becoming sober. There is really not so much about his life to be impressed with or outstanding. The real interesting events only happen when he crosses paths with Charles. This gave me pause to wonder why this story was not told from Mr Jacob’s perspective, as it would have been darker and more exciting. Jamie begins to question what Jacob is up to as his popularity soars from holding events where just by touching people with his rings (one on each hand), he heals them. True to his writing style, King continues to bring the reader fully developed characters and tantalizing narrative questions. This is why I continue to pick up his books — out of curiosity and how good his characters are. It’s what I enjoy most about his work. Fans of Stephen King will surely enjoy this story and while he doesn’t disappoint, overall, I personally felt this story turned out to be pretty weird in the end. I am sure it’s going to take me awhile to comprehend what it all meant. I would recommend it to those who have already read some of his other books, but not as a starter book for those just beginning to read him. Between the Layers is a cute fantasy read that is like a bit of Iron Fey series mixed with Alice in Wonderland. The story begins with Sera getting into a car accident and waking up in another land. The people there are confused by her arrival and some of her are convinced she is the lost Princess who will save them. In the beginning the 15 year old Sera comes off as very dramatic. She just wants to return home, really close minded to what the people are telling her about the land she is in. The fact that most of them don't believe her also makes her frustrated and overwhelmed. She does begin to make friends, animal friends as well. The story is a fantastical read with imaginative world building and strange creatures, both beautiful and deadly. There were parts of the story that made me laugh (The Toddlers) and made me cringe (The Honey Pot) really pulling me into the story and this other world of strangeness and danger. It takes a lot of coincidences and convincing that just maybe Sera is the Princess, even if she's not could they still get her help to fight? I would recommend this book as a cute, clean read that is fun and at several times had me gasp aloud as it was unexpected and exciting. My favorite character was Reeky and there are a lot of different characters to fall in love with. Possibly a introduction to a love interest? Sera is put into dangerous situations more than once and she shows a lot of strength by the end of the story. I am looking forward to see what happens next! In a futuristic Australia, the whole world is dependent on the Aquifer and the relationship between those who control it "The Rats" and those above, led by "The Council". This relationship is held with a yearly contract in which the Deliverer visits the Rats for a yearly conference. Luca is the next in line to become a Deliverer and the only other person besides his father that knows the way down to the Rats. In a world that has abolished human emotions as much as possible. The domino effect of the events that take place get harder and harder for Luca and others to control theirs. A council that tries it's hardest to banish such things, seems to be is loosing it's control of their people. Luca has to grow up fast, and that means learning new things. Secret things. It seems that everybody is not who they seem to be anymore. The story is a non-stop adventure that will take us through the school system, history museum and the aquifer itself. I think perhaps the saddest part of the story for me was the people that had to be undone. Those that caused too many wrinkles are cast away, and not in a good way. It's gruesome and really sad. But that part of life was a daily dealing for Luca and his father. 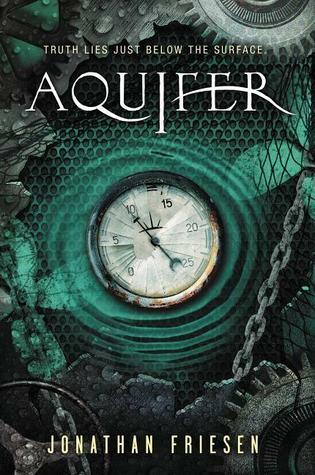 Aquifer was a very fast and thought provoking read. I recommend it to those that enjoy dystopian stories. It was a very nice change to read about a young boy finding love for the first time, and the friendships he gains throughout the book with both old and young. Even at his age he stands out as the strongest character in the book. I think it would be a little harsh to say that I hated this book, because I didn't. I just feel that it could have been more. It was as if we get a lot of filler story and not enough character development or depth to the story that I usually see in the first book to a series. There is quite a bit of action and twists that happen, yet I didn't feel that I was gripped or on the edge of my seat. There are four different characters we learn about and two additional that play more minor roles, but all are prominent in the story. Partly I feel that I would have found the story more gripping if it were told from a different perspective, Ro or Tima for example had a lot more ambition and intuition than Dol showed. The novel does end with a bang and I would like to see what kind of direction it takes. My personal opinion would be to read this right before the second book comes out. I think it would be more enjoyable to be able to continue on with the series immediately instead of waiting. really love this author's writing style. She is great at building suspense and anticipation (especially the angst for those love scenes). This book was not a disappointment in those ways. What I did find harder to love about this book than her others is the depth to the plot and storyline. The story contains constant action and a good mystery at it's heart. I was a bit disappointed to have the one character I felt has a great depth of information about the characters was killed off. Eventually the story became a bit predictable for me. I read a lot it seemed very familiar to me. What did catch my attention and I find was very well done is the romance aspect to the story. Jax had left his life behind, only to return to say goodbye to a loved one. He finds himself stuck in town for awhile and tries as best he can to explain to his ex-girlfriend Sam why he had to leave. He is the true definition of a “bad boy.” It is apparent that Sam's life is in danger and somebody is trying to kill her. Jax is there to rescue her and eventually begins to break down that wall between them. The story is told from both Jax's and Sam's Perspective, so we get to learn about each of their personalities well and watch that process slowly breaking down for each of them, bringing them closer, and the reader awaiting the outcome to that angst. There are a lot of twists to the story and it is slowly unraveled to us in a way that keeps us turning pages to find out what happens next. The main characters are both determined, strong and feisty and them working things out with each other and the romance aspect is the main focus of the story. It is a more mature novel and recommended for older teens, it also has a lot of violence, some alcohol and language. A very enjoyable story for those that enjoy seeing the bad boy and bad girl hook up. Sam is not your predictable girl next door and adds a lot of humor to the story. Super cute story of a mother and daughter with completely different personalities. The pictures are a whole story of their own as well. A lot of colors and activity on each page. I couldn't help but wonder what the animals that looked in the windows were thinking. The story is very humorous and I smiled the whole way through. This is definitely one I would recommend young readers, I loved it. Every time I see the words "inside the walls" I have no control over the fact that I instantly think of the movie The Village by M Night Shyamalan. I suppose this is because 1) I love that movie and 2) am always searching for similar stories. This was one of those stories that hit the mark for me. 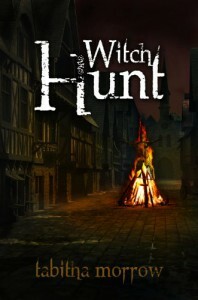 I really enjoyed the characters, the community and the witch craft. In New Salem there is a separation between the council and the townspeople mainly by the color of robes or clothing they wear. The council is known for their red robes, and the townspeople a very modestly dressed and the town has a very old feeling to it, no technology, farmland and everybody having to do their part for the town to keep alive. The behavior of the townspeople to stay in line is really strict and the kids are watched carefully. Don't forget the forest surrounding the village and the stone wall that blocks them off from any other societies that may be outside. Ruth is a great main character. She is daring and courageous, the fact that she does question things..mostly because she is different, is a huge plus in this story. There is very little down time and a combination of great elements and characters that really drives the storyline. There is a mystery of where the banished people end up going when they leave. Ruth and her coven are able to develop very amazing powers as they become stronger, and when they are together, that power grows. I am a newbie here! 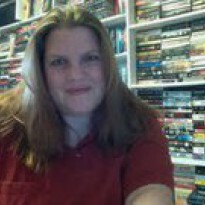 I tried importing my book list over from GR and it didn't seem to work. So now I'm debating on just starting off on a new and fresh start, but most likely with try importing again when I have some time. I still have a lot to learn about this website, but always up for new things and connecting with my fellow bookies!